Exciting News! 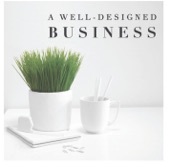 I was interviewed by LuAnn Nigara on her PODCAST, "A Well Designed Business." I'm excited to announce that DVD Interior Design was interviewed by Author and Podcast Host, LuAnn Nigara of A WELL DESIGNED BUSINESS, a national podcast for Designers with the inside scoop for Design Businesses. We chatted about branding your business through social media and making money online. A Well-Designed Business podcast is an investment in yourself and your business. Every week she speaks to interesting Designers and voices from the Industry who share an inside look into their businesses. How the online marketing space has really widened Deborah’s opportunities. How Deborah is now applying her experience from her blog, over the last few years, to her interior design business. Making a Plan to make money online through your website. Three good places to start with monetizing your blog. Creating income from Sponsored Posts and how to find them. How do Bloggers / Influencers make most of their money? You're ready to start incorporating monetizing methods into your site. How much traffic you need to be a successful affiliate marketer. The benefits of using evergreen content in your blog. Creating income through sponsored content. Why you have to be really passionate about blogging to make it. In the world of Podcasts, I have been a fan and a listener to Luann's podcast since its inception in 2015. Luann,the host of the A Well-Designed Business podcast, is an author, speaker, and business coach — as well as a mom, wife, and friend. I love listening in each week as she interviews and chats with industry experts in a personal manner along with inquiries into how they operate, think and choose the paths that they have. She speaks with interesting people in Design Industry weekly, offering nuggets of valuable information on her show. Each session is full of relevant details and tips for running a design business. I am honored to have been featured! Welcome to today's episode! On the show today we are going to be having an in-depth conversation with Deborah Von Donop, an interior designer, and well-known blogger. We will be talking to Deborah about monetizing your blog and also about how and why.. I hope you enjoyed listening! Did you learn anything new? If you would like to learn more about our" Visibility Package" click here. To Learn More about our "Visibility Package" for your business, visit our page "Hire Me". Happening, New York hosted the Architectural Digest Home Show, at the Javitz. Feeling inspired by the material and ethically manufactured products and businesses. See more (here) 2018 highlights from luxury interior design resources, new product introductions, and trend shift indicators. **Some posts on dvd Interior Design contain affiliate links meaning that at no additional cost to you, I may get a small commission if you make a purchase. All linked items are ones that I truly love, fit my style, and would use in my own home and help me to maintain this website. Thank you for your support. Thank you!